The Gefen 2x1 HDTV Switcher (EXT-HDTV-241N) enables effortless HDTV source switching using a single high definition display. A simple and reliable solution, the 2x1 HDTV Switcher links any two HDTV sources (DVD players and satellite set tops) to one HDTV display. It completely eliminates the need to disconnect then reconnect multiple HDTV sources, saving time by providing a fundamental tool that brings it all together behind the scenes. When all three devices (the display plus the two sources) are connected to Gefen 2x1 HDTV Switcher (EXT-HDTV-241N) and powered on, you simply select which source you want to view on the display using the Switcher, the IR remote that comes with it, or any universal remote you program to work with the Switcher. The HDTV Switcher is HDCP compliant. HDTV (high definition television) is a rapidly emerging video standard that transmits large amounts of visual data (resolutions up to 1920 x 1200 and 1080P) using DVI (Digital Video Interface) connectors, resulting is crisp, highly defined visuals that resemble movies shot on 35mm film. 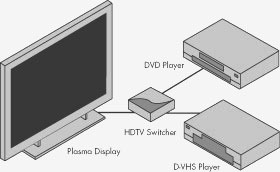 Since 2000, DVD players, computers, televisions and monitors have been equipped with the 24-pin DVI connection ports. DVI is the current transmitter of choice for HDTV because it is a purely digital interface that retains the integrity of the video signal through any transmission - even when sent over long lengths of cable. With DVI, there is no digital-to-analog or analog-to-digital conversion process that needs to take place before, during or after transmission. This streamlined, straightforward process makes DVI the current preferred interface for HDTV. Simply connect your HDTV display to the Switcher's (EXT-HDTV-241N) display output. Then connect both HDTV sources to the Switcher's inputs using the DVI cables that come with the Switcher. Once the sources, the Switcher and the display are all powered on and connected, you simply select which source you want to view.